On Thursday (1/27) the Blue Nile in Harrisonburg will play host to what looks to be a very exciting show. Harrisonburg/Norfolk-based Super Vacations will headline the show while Roanoke’s own Eternal Summers and Charlottesville’s Order. If you are in the area and can make it out I high suggest going. Order has been around for quite a while (2001 or so) and is amazing to see live. This show starts at 9pm. Flannel Gurl Records will be having its last Flannel Friday show this Friday (1/28) at the unusual starting time of 5:15pm. The reason for the start time being so early is there are a lot of bands playing together on one bill. Eight bands on one bill to be exact. A couple of notables playing are Georgia’s the Emotron, Florida’s imadethismistake and Harrisonburg’s Buck Gooter. Why is this the final Flannel Friday? Rumor has it that Flannel Gurl Records is going to focus towards more label related functions. 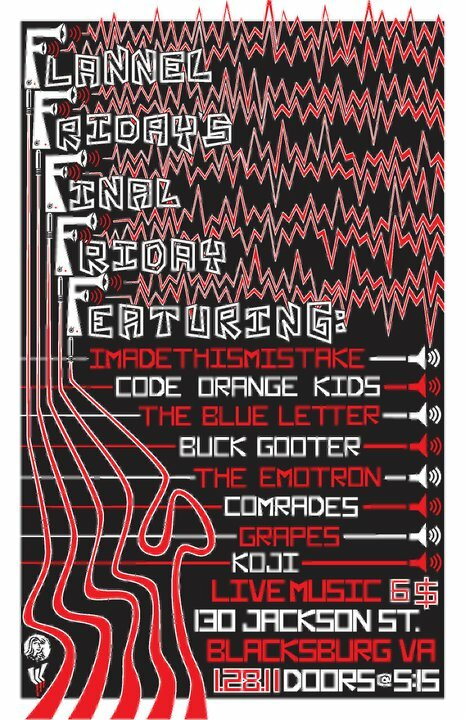 Come out to a last hurrah of sorts this Friday in Blacksburg at Jax on 130 Jackson St., $6. 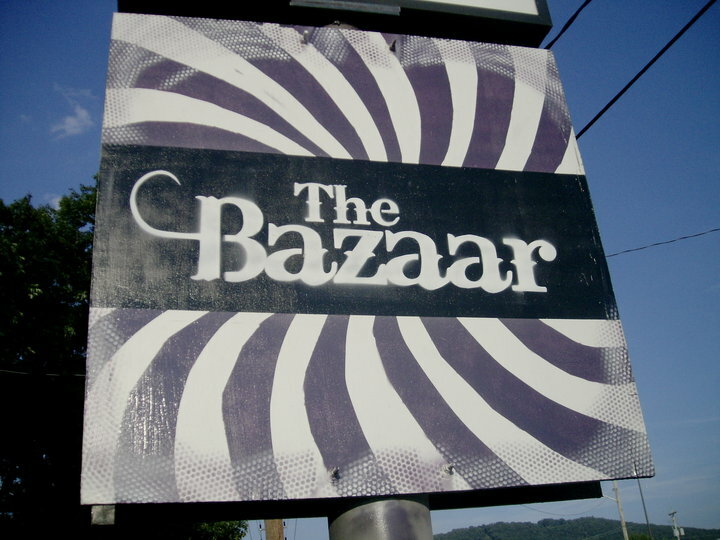 On Saturday (1/29) the Bazaar on Brandon Rd. will host Roanoke’s Amanda Bocchi & the Body Parts. 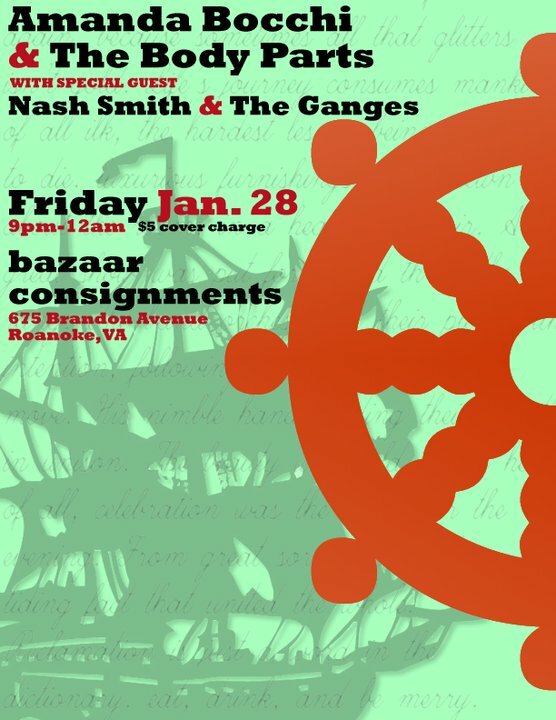 Also playing will be Blacksburg-based Nash Smith & the Ganges who will be opening the show. Personally, I am very excited to check out this new group from Blacksburg. I listened to their recordings a really dug it. A good mix of Portishead and Beach House. This show will start at 9pm, $5. Get there on time!!! Running from now until February 27th at the Roanoke Natural Foods Co-Op is Stephen Cort Smith’s “the Dream Comparison”. This is a display of selected works created in MS Paint, the unusual medium Smith has become known for. All prints are for sale ranging from $10-$15. 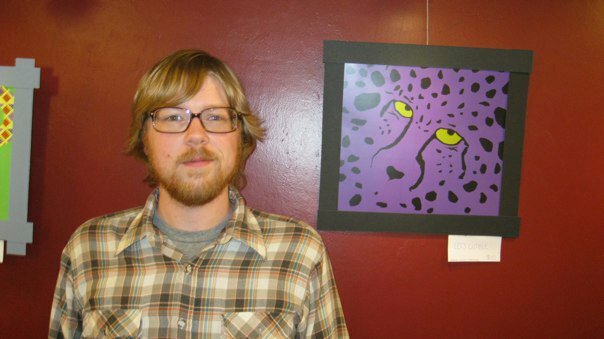 Above is Smith standing next to his piece entitled “Let’s Cuddle”. On Monday (1/31) the Shadowbox on Kirk Ave. is showing 80’s cult classic comedy, the Heathers! Come watch Winona & Christian kill for revenge and romance. Witness the famous dead gay son scene. Experience the trauma a high school goes through when struck by a mass “suicide”. This film starts at 8pm. I’d like to end this post with two really awesome articles on one of the best venues in Roanoke, Bazaar Consignments. Jamie Booker’s consignment shop has come a long way in its year and a half of operation. Its hosted a slew of shows proving you can have great bands play, people turn out and not charge an arm and a leg at the door. Other music oriented venues have taken notice of the success of this basement consignment shop with Kirk Avenue Music Hall being one of these. In fact, Kirk Avenue has teamed up with the Bazaar to bring a monthly showcase to Kirk’s doors called “The Bazaar Presents…”. This showcase will follow the Bazaar’s tradition of only cost $5 as opposed to Kirk’s more pricier admission fees. On March 25th the first show of this series will take place featuring Magic Twig Community bands the Young Sinclairs & the Sad Cobras. Jamie has had two articles on her shop come out this week. Read the article in the Roanoke Times’ Sunday extra section HERE! Also check out this article on the Bazaar by Blue Ridge Traditions HERE! Congrats to the Bazaar!